Thirty-three participants from 17 schools attended PAISBOA’s Sustainability Group meeting at Ancillae-Assumpta Academy on January 15, 2019; the topic: Schools, Climate Change & Solutions. Climate Reality Leadership Corps member and Haverford College’s Vice President & Chief of Staff Jesse Lytle gave a solutions-oriented presentation on climate change. We are thrilled and honored to announce that we’ve been nominated for the 2018 SustainPHL Award. The SustainPHL Award recognizes those helping to make Philadelphia a better, cleaner and greener city through the work they do and by inviting others to take part. 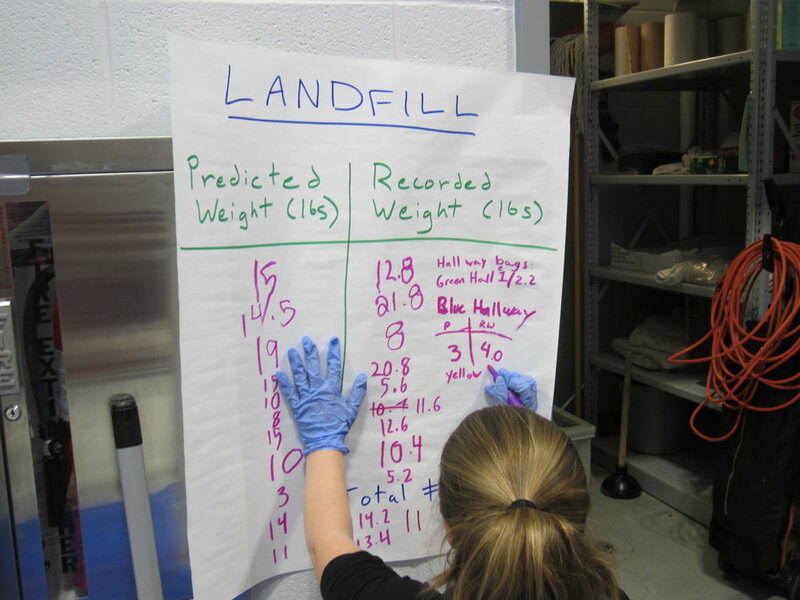 Cooke Elementary students predict how much waste they generate in the cafeteria before weighing each bag as part of their waste audit. Teacher Christine Szegda received a grant from the Delaware Pathways to Green Schools Program. Ms. Szegda enlisted school sustainability consultants, Mary Ann Boyer and Sam York of Boyer Sudduth Environmental Consultants (BSEC) to help plan and run the audit. Together, they set the date for the first waste audit on March 13th and developed an agenda for the day. When the day came, Ms Szegda’s TAG students, the Cooke Elementary Custodial staff, BSEC, and parent volunteers came together to make the day a success. The fact that it was chili day did not deter the TAG students, who eagerly investigated the waste in order to find the information that would let them develop an action plan for reducing waste. Students were surprised by how much food was thrown away each day. “After combing through unopened snack bags, unpeeled bananas, and half eaten lunches,” noted Ms Szegda, “they had a real ah-ha moment.” The students learned that the average American throws out 4.4 pounds of trash a day. After seeing the food waste, students began to think about more sustainable and affordable solutions. Giving students only as much food as they will eat and encouraging students to use the "share bin" would help reduce the amount of food that would end up in a landfill each day. Article submitted by Sam York, intern of Boyer Sudduth Environmental Consultants. In every division, Friends’ Central students are taking a leadership role when it comes to waste generated on their campuses. This is just one of the many steps the School has taken to reduce environmental waste and improve sustainability efforts in the last few months. Springside Chestnut Hill Academy recently earned the Green Flag award from the National Wildlife Federation’s Eco-Schools USA program, making it the first independent school in Pennsylvania to win this award for sustainability progress. SCH’s green footprints have been purposeful over the past two decades. Its initiatives have extended from the classroom to the roofs and from the cafeterias to the Wissahickon Watershed. In 2012, the U. S. Department of Education recognized SCH as a Green Ribbon School. SCH joined the Eco-Schools USA program in order to have additional benchmarks to accelerate progress. Friends’ Central School recently launched an energy saving project on both of its Wynnewood campuses, projected to save 38% of energy used annually. Equal to 9,100 million BTU’s, these savings are the equivalent of eliminating the carbon emissions of 3,000,000 miles driven by passenger cars, or the carbon absorption of 30,000 trees for 10 years. Learn how one school is reducing its energy consumption looking at its "energy vampires." Environmental consultants Mary Ann Boyer and Anne Sudduth joined about a dozen Abington Friends faculty members from all three divisions for a presentation about sustainable projects at “green schools” and a brainstorming session about what the AFS Outside Committee might tackle next. We are thrilled for our client, Springside Chestnut Hill Academy, which was recently featured in the Chestnut Hill Local. We are proud to have worked closely with SCH on both projects: Green Restaurant Certification and the Eco-Schools USA Bronze Award.